iTunes error 3194 is one of the most annoying errors that come when you are trying to restore, update or even sync your iPhone. There are plenty of the errors too, that might arise while restoring or updating your iPhone, but the error 3194 is notorious of all and admit it, we all fear this error while doing the same. Quit it and launch terminal. Enter the following command “sudo nano /private/etc/hosts” and press “Enter”. Now you need to enter the password that you use to login to your Mac and terminal will display the host’s files. If there’s any entry for “gs.apple.com”, remove it. Add a # symbol along with a space before the “gs.apple.com”. Press “Control-O” to save the file. Now save the file name by pressing the enter key and “Control-X” to exit the editor. Restart your mac and run the iTunes again. Tap search option at the right edge of the screen and type “Run” and then tap the Run icon. Type %WinDir%\System32\Drivers\Etc in the Open box, and then tap or click OK. This command will help you to open Etc folder. Double click on the host files to edit it. 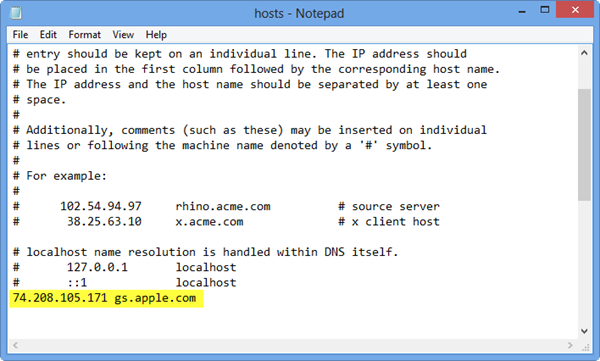 If there are any “gs.apple.com” entries, remove them and save the hosts files. Now try to restore / update your iPhone again and it will surely work. If you don’t get any “gs.apple.com” entry, and still getting that pesky 3194 error, then you need to temporarily disable your firewall or any anti-virus software installed on your computer, as they can interfere with your connectivity to Apple servers. 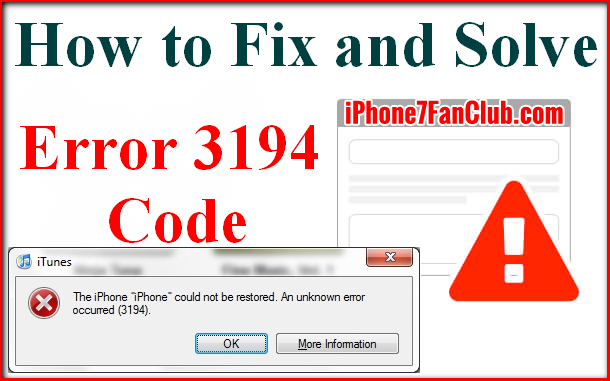 If none of the solutions mentioned above work to fix the iTunes error 3194, then switch the device and connect your iPhone to that device, with a different internet connection. Also make sure you are using the Latest Version of Apple iTunes on your PC / Mac. In case you are out of luck, and above mentioned fixes are not working at all. Make sure you have not replaced your iPhone’s battery with a local one. You must have original iPhone battery installed on your iPhone, in order to avoid Error 3194 on iTunes Restore / Upgrade process. Using original data cable is also recommended. So, these are the potential fix for the iTunes 3194. Try these fixes and you will definitely get rid of that error along with some others like: “Error 17”, “Error 1639”, “Errors 3000-3020”, “Errors 3100-3999” and “This device isn’t eligible for the requested build”. Next story How To Free up Storage on iPhone 7 / 8 with iCloud Photo Library?